Also serving communities of Girard, Jacksonville. There are 9 Assisted Living Facilities in the Chatham area, with 2 in Chatham and 7 nearby. The average cost of assisted living in Chatham is $3,587 per month. This is higher than the national median of $3,346. Cheaper nearby regions include Springfield with an average starting cost of $3,564. To help you with your search, browse the 26 reviews below for assisted living facilities in Chatham. On average, consumers rate assisted living in Chatham 4.8 out of 5 stars. Caring.com has helped 5 families in Chatham find high-quality senior care. To speak with one of our Family Advisors about assisted living options and costs in Chatham, call (855) 863-8283. Chatham is a charming village located on the outskirts of Springfield, Illinois. Residents can enjoy quiet living with all the conveniences of shopping, dining and entertainment just a short drive away. Senior citizens who are looking for a calm and relaxing place to call home should consider Chatham. For seniors who wish to remain as independent as possible, but require a little assistance in maintaining their lifestyle, an assisted living community in Chatham is a good option. Assisted living facilities (ALFs) in Illinois are regulated by the Illinois Department of Public Health to ensure residents' needs are met. There are two ALFs in Chatham, five in Springfield and one in Rochester. These communities provide personal care services that include activities of daily living. The cost of living in Chatham is 7.7 percent lower than the U.S. average, making it an ideal choice for seniors who rely on a fixed income. Chatham receives an average of 201 sunny days per year, which is slightly lower than the national average of 205 sunny days annually. Summers are moderate while the winter months can be quite chilly with an average low in January of 19 degrees Fahrenheit. While the warm and sunny summers are enjoyable, such cold winter weather might be difficult to spend time outside. Illinois is a tax-friendly state for seniors because it exempts retirement income, including Social Security retirement income, pension income and income from retirement savings accounts, which can be very beneficial to seniors. The Chatham area has no facilities from which to choose in the event of a medical emergency or illness, with the nearest major hospital located in Springfield. Chatham has a low crime rate. It's 82 percent safer than other U.S. cities, so seniors should feel safe in the area. Chatham has an array of community resources for seniors, including the Senior Citizen Center, which provides activities and programs for senior citizens in Chatham. A community park is also available for those who enjoy taking walks and spending time outdoors. Assisted Living costs in Chatham start around $3,587 per month on average, while the nationwide average cost of assisted living is $4,000 per month, according to the latest figures from Genworth’s Cost of Care Survey. It’s important to note that assisted living rates in Chatham and the surrounding suburbs can vary widely based on factors such as location, the level of care needed, apartment size and the types of amenities offered at each community. 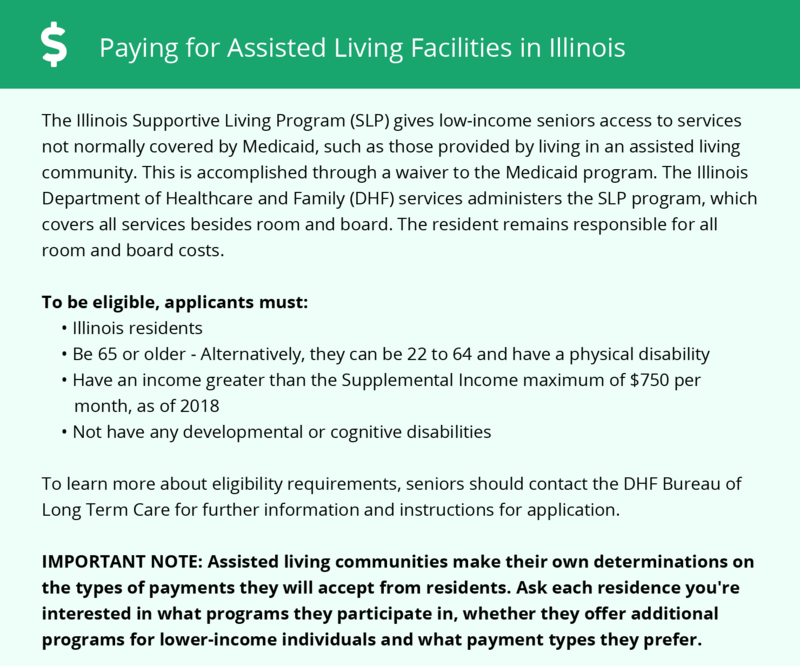 Eligible seniors in the Chatham area can apply for funding to help pay for assisted living through Illinois' Medicaid Waiver program or the optional state supplement program. Chatham and the surrounding area are home to numerous government agencies and non-profit organizations offering help for seniors searching for or currently residing in an assisted living community. These organizations can also provide assistance in a number of other eldercare services such as geriatric care management, elder law advice, estate planning, finding home care and health and wellness programs. To see a list of free assisted living resources in Chatham, please visit our Assisted Living in Illinois page. Chatham-area assisted living communities must adhere to the comprehensive set of state laws and regulations that all assisted living communities in Illinois are required to follow. Visit our Assisted Living in Illinois page for more information about these laws.